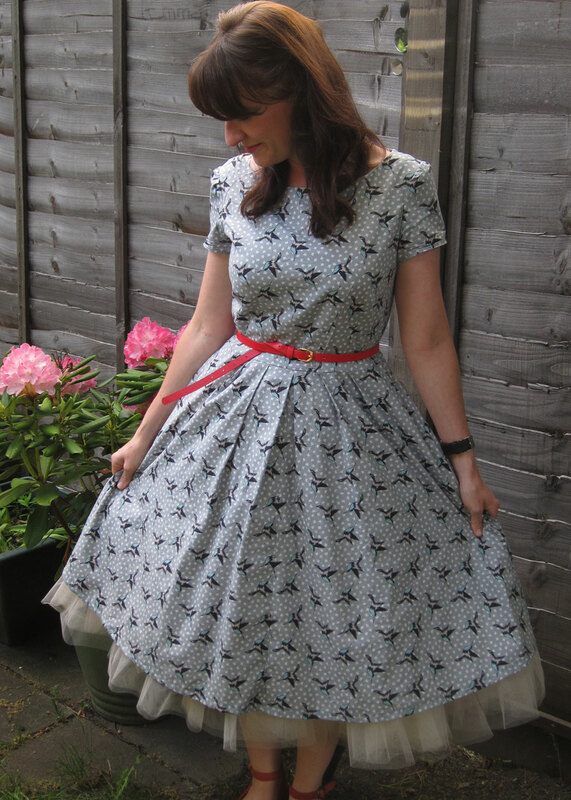 This entry was posted in Simplicity, Stuff I've made and tagged Dresses, Simplicity 2444 by Joanne. Bookmark the permalink. Awesomus Maximus Hilarious! Ooh that did make me laugh…! I know – the pics don’t really show any fitting issues and there aren’t really… it’s more about neatening up the bodice a bit round the neckline and that’s all. 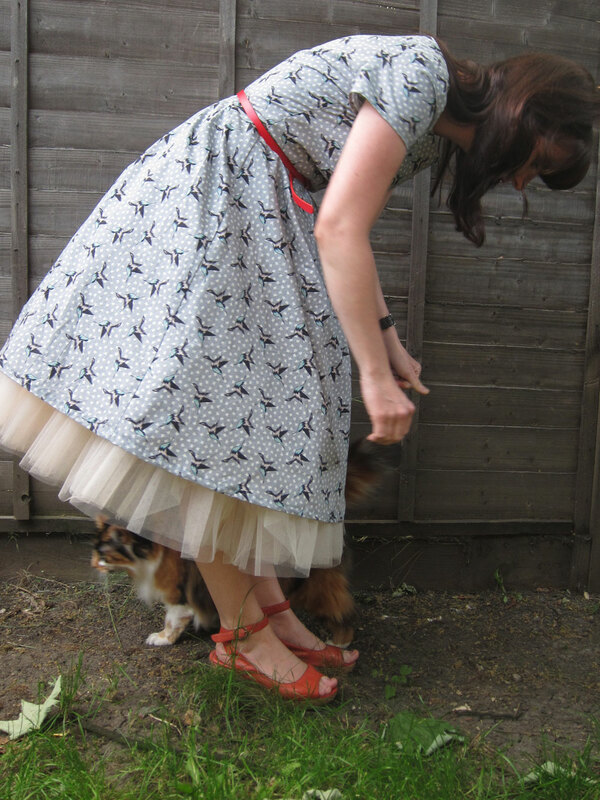 It truly is a wonderful dress – I highly recommend it! Oooh I love the American Bar!!! So beautiful! The petticoat completes it. So timely – I’m just about to cut this out but struggling to decide which size to cut. I love your dress, it’s gorgeous! Great! Thanks for the link, can’t wait to get started! I’m considering cutting the front skirt on the fold – does it really need the front seam? Thanks Marie – I’m already really excited about further versions – it’s amazing how a good pattern can get your sewjo up and rearing to go! Fantastic – this pattern seems to be getting the thumbs up from bloggers, and I love your version. It’s ace Kerry – so so easy and although I’ve never done a Project Runway pattern before I believe they’re known for their almost infinite possibilities, and this dress is super-super-adaptable which makes it a winner. Oh YES we must. Do you fancy making it too Jane – gwaaaan – it’s so you too! This is AWESOME-O. I adore the fabric and the fit looks spot on to me. You know, I didn’t even try to work out the yardage, I just eyed it and thought “eh… 3 metres will do” and I just managed to squeeze it out! You and I Joanne, we’ll be the quare 2444 twins in our multiple versions of this beauty! The quare twins – I love the norn irishness of it all! Let’s do a wee jig to celebrate! 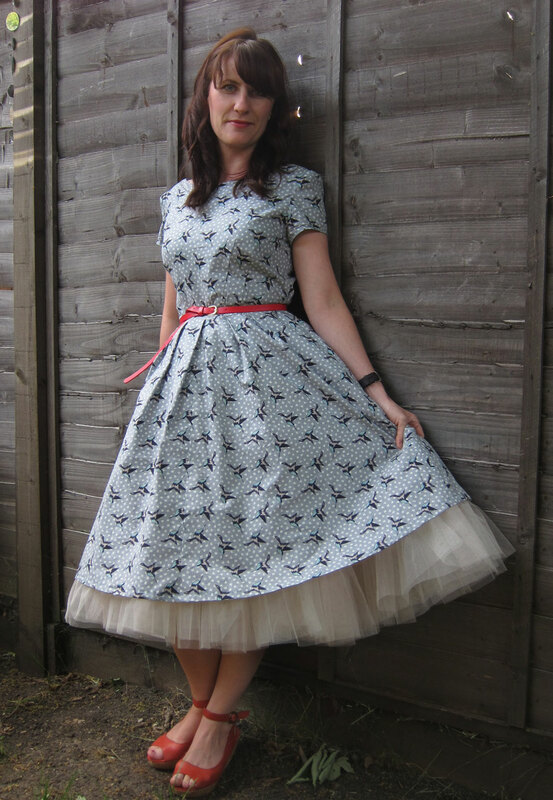 I stumbled upon your blog about a week ago and am so pleased I found it – This is a lovely dress, well done (impressive on the inside too)! 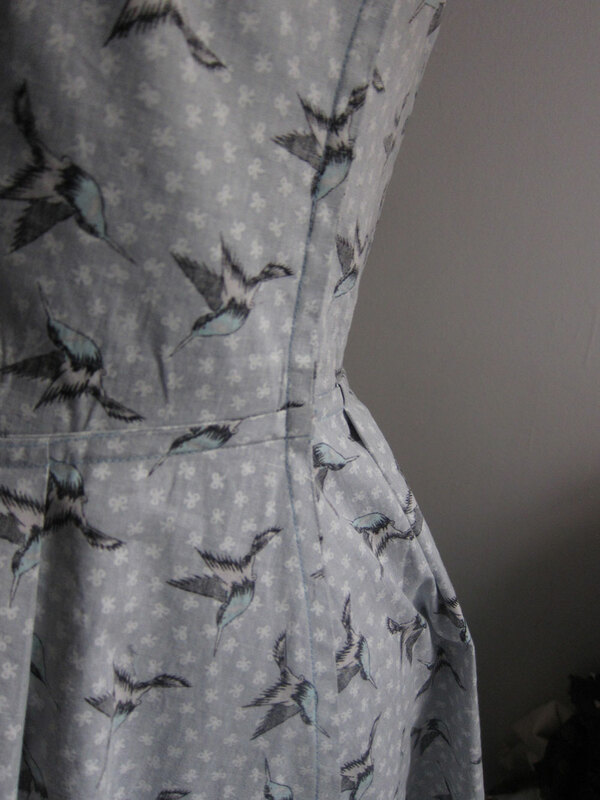 Keep up with the inspiring posts … Ooh and the bird fabric is great, I too love birds on my dresses!! Love this! You look cute as can be! I agree that you should make several of these! It’s just the right amount of twirly! When I made this dress for my mom, I freaked out with all the fabric requirements, too, and ended up with tons of leftover fabric. Oh well! I found the instructions way confusing, too– I ended up highlighting the parts that applied to me just to try to stay sane! I couldn’t quite figure out how the pleat thingy at the CF of the skirt was supposed to work, so I winged it and it worked out OK.
exactly the same here Ginger! I wasn’t sure if the pleats should slightly overlap in the middle or not so I overlapped slightly and it seemed to work out – who knows eh? Good enough to wear inside out, where did you get that fab fabric. Great thanks will have to check it out would love a blouse in that fabric. Its so very gorgeous! 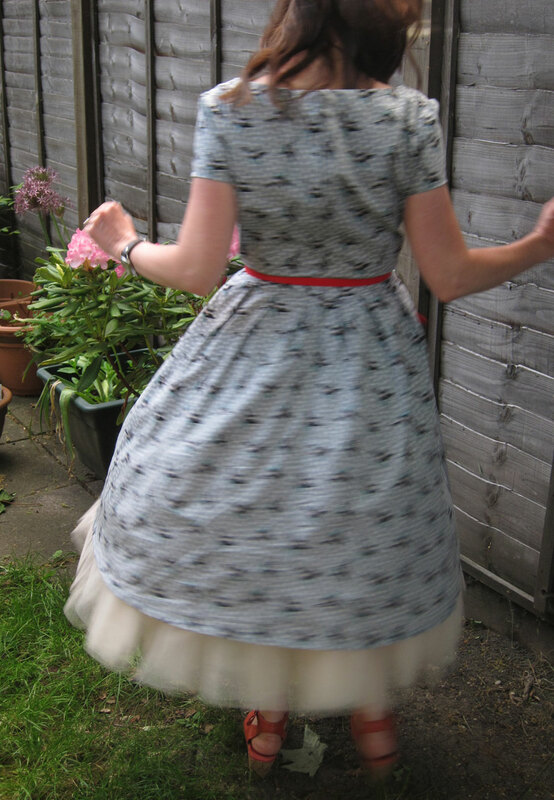 I love it with the petticoat!! I love it with the petticoat too Sallie but sadly it’s a little impractical for work 🙂 Hope your toe’s better! OMG you’re a princess!!! I love it so much, especially with the petticoat!! You must feel so incredibly girly wearing that!! This pattern is currently on my sewing table. Now just to find the time to sew it. You dress is very pretty. You look lovely! I think this is one of those *perfect* patterns. It’s almost foolproof! It certainly is and i LOVE your version! It wasn’t very heavy Tilly, not a quilting cotton anyway. The sleeves do sit quite proud of the dress anyway so you might be ok. It is a great dress to do – you’ll whip it up in no time! I’ve nearly finished my 2444 and I’ve used a heavy cotton and IMHO it works. I’m hoping to hem and post in a couple of days! All done! I love this pattern. It’s almost a new religion for me! I’ll shut up now, as you’d answered further up. Love this new to me supplier – £3.49 a metre?! Very happy! Ah glad you saw it! It’s great isn’t it? !